Friends, Not Food is a rare Order Hall mission. This mission takes 12 hours, costs 150 Order Resources, and requires 3 level 110 Champions with 760 item level. Received this from the Friends, Not Food mission in my class hall several days ago. An easy enough mission to complete, it took 12 hours to finish. Its appearance may be tied to the overall item level of your champions, as I've noticed the more I increase their ilevels the greater variety in class hall missions I'm offered. 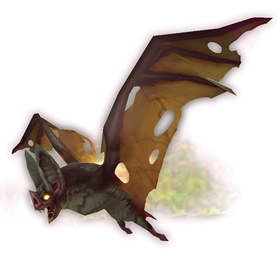 I'm disappointed with this pet's model - hardly different from the Felbat Pup in appearance. I was hoping for more obvious, red flames, but ah well. The mission Friends, Not Food is a level 110, ilvl 760 misson that takes 12 hours.